Slow-cookers are apparently a godsend when it comes to easy, leftover-making meals, so I thought it high time to try my hand at it. 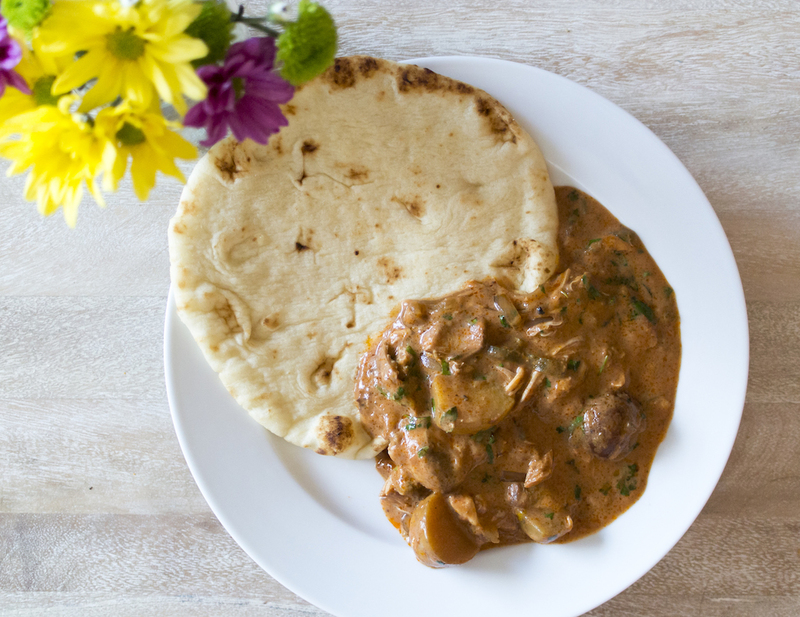 I’ve always been a fan of butter chicken, a classic staple in any Indian restaurant, and this recipe seemed like a straightforward one to start with. Crumble 1/2 piece of naan into coarse crumbs; transfer to 6-quart slow cooker. Add onion, potatoes, chile and cilantro stems. Arrange chicken thighs in single layer over vegetables and sprinkle with garam marsala, 3/4 tsp salt and a few grinds of pepper. Dot with butter and add cinnamon stick. Pour tomato sauce over top. Cover and cook on low, 7 hours. Uncover and switch to warm or turn off. Gently stir in heavy cream, breaking chicken into chunks; let stand 10 minutes. Stir in cilantro leaves and season with salt. Serve with remaining naan. In checking out my sister’s recent butter chicken recipe, this version had considerably less butter and spices. It was very simple to make (which I appreciated), and it actually turned out to be surprisingly tasty. Don’t know if it tastes truly like classic butter chicken, but it nonetheless tastes good and flavourful. The tomato sauce also yielded a wonderfully saturated colour to the dish, contrasted nicely by the cilantro leaves.